Last winter, we posted an introductory article about one of the earliest known Animal Rights/Animal Liberation groups in the Grand Rapids area, known as West Michigan for animals. In that initial posting we made the point that the current efforts around banning the use of circus animals in Grand Rapids and other animal welfare campaigns are making gains because of the hard work that earlier activists engaged in. The Grand Rapids People’s History Project has recently met with some of the animal rights/animal liberation activists from the 1980s and 1990s. Some of them have shared archival material and others have agreed to be interviewed for future postings. Upon returning from this national action, local animal rights activists were inspired to do more organizing, particularly at the local level. Thus, in early 1983, West Michigan for Animals (WMFA) was founded and sought out a non-profit status in Michigan. Since several of the founding members met at the Wyoming Rodeo protest in 1982, they made rodeos an early focus of their work. At that time there were rodeos taking place at several locations in the West Michigan area, including Wyoming, Sparta and Grattan. 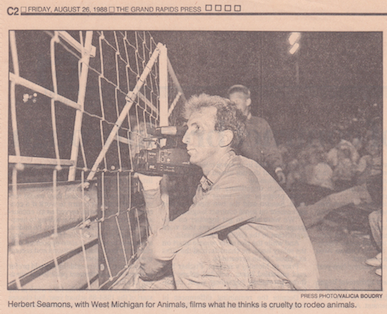 The group investigated and documented abusive treatment of animals, as you can see from this photo that appeared in the Grand Rapids Press, where founding member Herb Seamons is seen filming at a local rodeo in 1988. In addition to documenting animal abuse, WMFA began to use other tactics, such as popular education through signs and handouts to people who attended rodeos. Beyond public education, the group pressured financial sponsors of area rodeos. 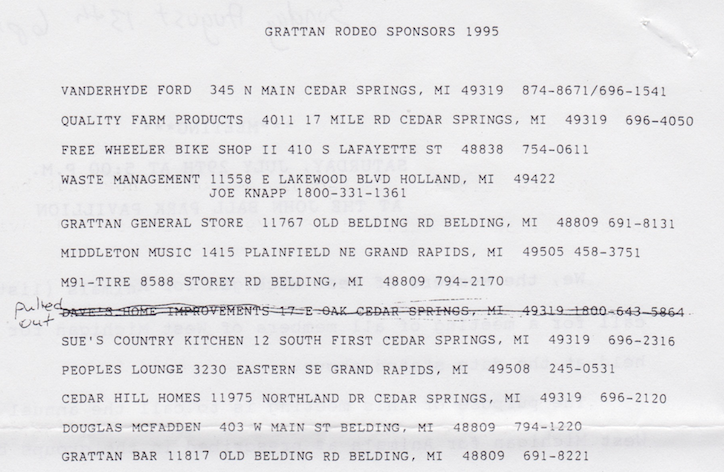 In 1995, WMFA had published a list of rodeo sponsors and sent each of those sponsors a letter. In the letter, WMFA focused on informing these sponsors about the cruel treatment of animals used at the rodeo. In addition, WMFA stated they would contact St. Jude’s, which was the recipient of the rodeo fundraiser, and they would be contacting Kent County Animal Control to see if regulations were being violated. These tactics and others eventually paid off in one instance. While doing research on the rodeo that took place in Wyoming, the group discovered that the City of Wyoming was providing funds for the rodeo, despite the fact that the rodeo was losing money. Again, WMFA pressured sponsors with letters and picketing. The financial debacle of the Wyoming Rodeo that was exposed was what eventually caused it to shut down. 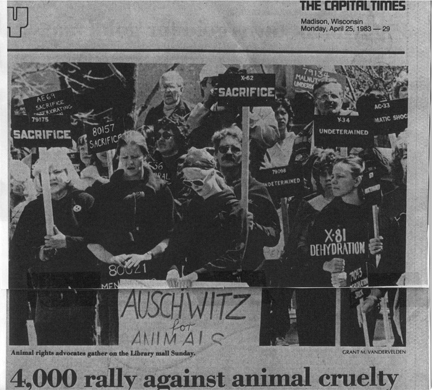 This is just one example of the type of organizing and campaigns that West Michigan for Animals was involved in during the 1980s and 1990s. It also demonstrates that organized resistance can be effective and it can be a source of inspiration for people involved in similar struggles today. This entry was posted in Animal Rights/Animal Liberation and tagged anti-rodeo campaign, founding of West MI for Animals, letter to rodeo sponsors, protest animal cruelty in West Michigan, West Michigan for Animals. Bookmark the permalink.